I uploaded the Lily Allen songs Smile and LDN (stream them here) from last week's SNL. I guess NBC wasn't too happy with that . . . I found it kinda hard to take the warning seriously too seriously. Why? 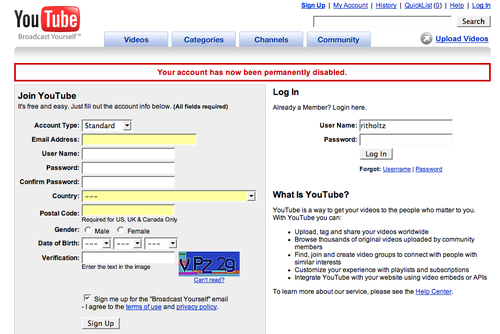 The "YOUR ACCOUNT HAS BEEN PERMAMENTLY DISABLED" was conveniently located on a form, to ah, um, open a new account. NBC taught me a lesson -- no more promoting their shows anymore! Yeah.. nothing like the networks making themselves even more irrelevant, is there?